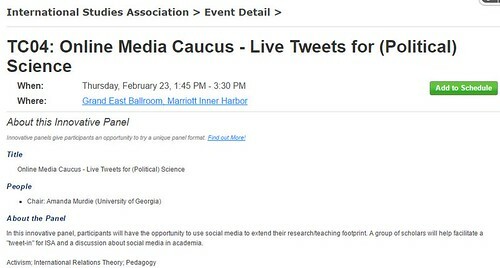 My dear friend and coauthor Dr. Amanda Murdie (University of Georgia) is chairing the Live Tweets for (Political) Science session at the 2017 International Studies Association meeting (starting 1:45pm Baltimore time). You should join us! This blog post will keep the tweets specific to this session as a tweetstream. IF you would like to join us, please come to the room, or join us remotely using both the #ISA2017 and #TC04 hashtags. Tagged with conferences, International Studies Association, ISA, ISA 2017.